My work is an attempt to document my existence - to leave a visual record of my thoughts, ideas, and fantasies. I reside in the wilds of Kentucky, with a bird, on a mountaintop, right next to the sun, where I create my artwork high on butterfly wine." "Theres something paradoxical about Bruce News eloquent mixed media pieces. Employing his own consistent and complex visual language, New conveys symbolic messages that are at once universal and extremely personal." " Bruce News art takes us somewhere outside of our own experience, but intimately deep within his own. Ultimately, the experience that he presents us with is love. His recurrent imagery of birds, exalted female figures on pedestals, crystalline shapes , letters and numerals are all visual manifestations of his love for his wife, Robin." 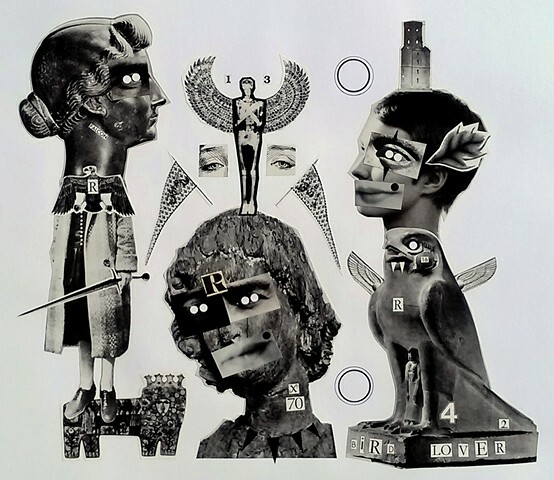 "Taken together, Bruce News collages tell the story of a mans life, his love for his wife, and the challenges they face together in a way that renders the common act of living as mythically powerful. These works are daring, even radical, in their design and execution, but the ardor, devotion, and exultation that gave rise to them ensures their timeless appeal." "New knows what he is doing. It's fair to say that he makes outsider artI can't think of anything that better describes his drawings or thinking that informs them. The twist is that we, his viewers, are the outsiders. Only by emulating the slow, detailed, and attentive processes of the artist himself can we begin to approach the beautiful, private interior or the intimate quality of the love he shares at home, with Robin." "News drawing style is certainly unique. The eyes of his characters have two irises, and in some instances they have a double row of eyes. Its Cubist in style, though highly edited, allowing the negative space to show the layered and yellowed newspaper below." "The creation of his work is itself a labor of love; his affection for his wife is clear in his pieces when the viewer understands the back-story, New's influences, his symbolism, and his method." "New's imagery is beautifully complex with unique elements reflecting our society. Graphic figures with symbolic iconography contrast columns of the printed wordboth reflecting occurrences of today's world. The various graphic elements are manipulated to create an intricate layered surface to explore and contemplate."